Western action films are almost a genre of their own. Take one part wild, wild west and another part a high speed, adrenaline driven race to catch the bad guy and you end up with a western action film. While most western movies are generally action movies, there's a certain energy to western action films that embodies much more than just a great chase scene. Western films are generally any film based in the time of the Wild West. Not sure what the Wild West is? Picture being 'out west' (typically gold-rush US states) back in the time period of cowboy hats and spurs. Often, there are ranchers in western films and a horse is generally the preferred mode of transportation. 'High noon' is a popular concept of the time, as are terms like 'saloon' and 'sheriff.' Relics of the past, western films often talk of a simpler life style where the town goon could be run out by a simple gunslinging battle with the local town stud. What Is an Action Film? Put on your seatbelt: action films are often fast paced and bumpy! Using physical movement rather than other literary and cinematography techniques to portray plot, an action movie is any film that uses a significant amount of movement. Sometimes confused with thrillers and suspense flicks, action movies use movement to capture viewer attention. In modern day productions, action movies are most known for their weapon usage and special effects. They often involve cars and high speed effects, such as in The Fast and the Furious and Air Force One. Action films are often looked at as 'guy films'; however, many women find themselves adoring high-action scenes. How Are Action and Westerns Combined? There's a lot more to your average western action movie than first meets the eye. Some have stronger action (similar to what many believe is action nowadays in accordance with action films) while others involve more subdued effects. Whichever type of movie you are watching, sit back and enjoy some of the best films in cinema. 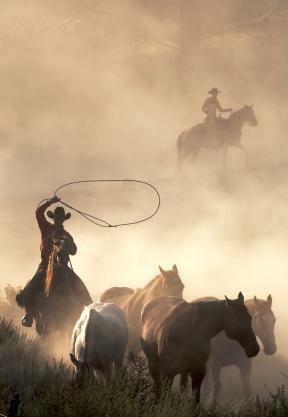 Many mark the western genre as one of the strongest genres out there. With numerous action adventures, the fun times are endless.